Vintage in a Modern World: Yay or Nay? I bought this purple sweater a while ago on sale. I wasn't in love with it but it was a really good sale and I couldn't say no. 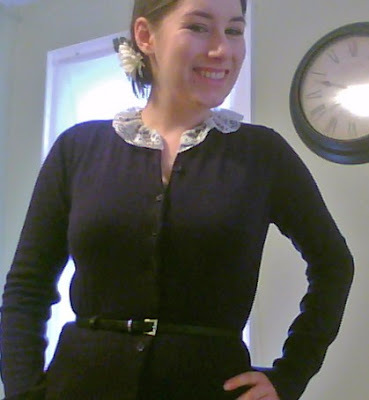 I really regretted buying it after since it is very inferior in quality compared to the vintage clothing I normally buy. 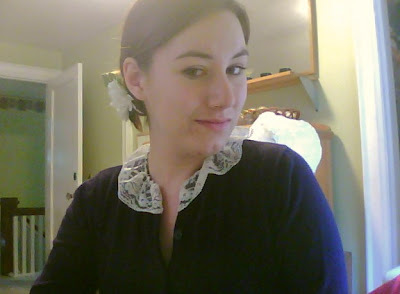 I decided to try altering it by adding a lace collar. Now I am not sure if I like it or if it just looks dumb. What do you guys think? Yay or Nay? (Sorry for the terrible web-cam pictures. I really need to find my tripod for my camera.... and buy a new camera that actually auto focuses....). Nay. Its either not big enough or too big. I cant decide. I agree, nay. 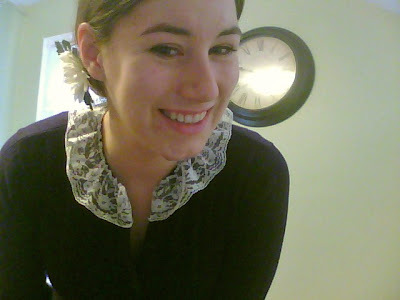 But I bet you could dress that sweater up with some pretty vintage buttons and a brooch! I thought it looked fine, but the other commenters have me second-guessing myself.